Burly hero with a chequered past?. Highly-detailed destructible landscape?. Big guns with chainsaw bayonets?. Ohhh yesss! And horribly nasty they are too, as they take the concept of ugly to an all-new hyperreal level. The ultimate HD edition of Resident Evil™ 4. The new PC version includes everything from the prior iterations including subtitle support in. Factory Sealed. Minimum PC Specs has been kidnapped. Leon battles horrific new creatures. Dying Light: The Following - Enhanced Edition takes parkour-fueled zombie survival to a whole new level. This item has been lightly used and is in as-new condition. The case and disc are unblemished. 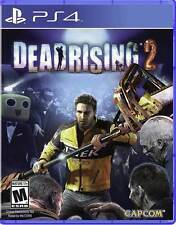 In the sequel to the original Dead Rising, players step into the shoes of Chuck Greene, professional motorcycle racer. Can he protect her and make it out of Fortune City alive?. 10 years of zombie slaying action - 2016 is the year of Dead Rising, and what better way to celebrate the 10 year anniversary of the series. I ain't afraid of no Necromorphs! The vastness of space is beyond, twinkling at you. The Sprawl is sat below looking industrial and stark. It's the sort of place British novelists like Orwell or J.G. Ballard would warn you about. Dead Island doesn't make you double-hard like Left 4 Dead or ready-qualified for zombie-fighting like Resident Evil. It doesn't make light of the fact that zombies want to eat your brains, like Dead Rising does. Resident Evil 5 - For Playstation 3 -. All pictures used are of the actual item for sale -. If anything, there seems to be more zombies inside the mall than outside. It is up to you to help Frank find out who is behind this deadly epidemic. With Konami and developer Double Helix looking to up the impact on your bladder stability to ever greater heights. We think it's safe to say that the town's denizens aren't all just sleeping off a late one from the night before. As you might expect, Konami utilises the 360's high definition capacities to ramp up the sense of impending doom. RESIDENT EVIL 7: BIOHAZARD - GOLD EDITION. DISC AND CASE BOTH IN MINT CONDITION. Cursed Mountain for Nintendo Wii. Used in acceptable condition. Disc in very good condition. PayPal payment only. Check out my other listings! Yeah, that's right. Since he just happens to be a hitman for the Mafia, much bloodshed ensues. Jackie's not the pretty-boy he was in the comics: he hangs about in seedy back alleys and subways rather than glamorous night clubs, and he looks a bit Goth instead of a bit Gucci. Survivors can work together or act alone using their situational awareness, while killers are on the hunt in first-person, focused on their prey. Play anything from a powerful Slasher to terrifying paranormal entity. 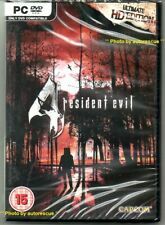 Resident Evil, 5 Game Bundle - GameCube (PAL) Including: Resident Evil 0 Resident Evil Resident Evil 2 Resident Evil 3, Nemesis Resident Evil, Code: Veronica X All supplied complete with original boxes and instructions as per photos. Please check my other GameCube listings. Happy to arrange local collection (Brighton) or to combine postage. All items will be posted out 1st class signed for. Nor will you have to keep a “secondary account”. This is not a code but instead a different way to get the clothes onto your account. Link to showcase all the clothes (not my video) . The Last of Us -- Ellie Edition (Sony PlayStation 3, 2013) - European Version. Condition is Very Good. Dispatched with Royal Mail 1st Class Large Letter. Kept in great condition, absolutely love this game. Hope someone can enjoy this as much as I have. This item does not include Firefly key ring and ps3 controller sticker. ps2 MANHUNT 2 Game Survival Horror Stealth Playstation PAL UK Version. Condition is Good. Dispatched with Royal Mail 1st Class Large Letter. Working together, they must find out who took them and to what sinister end. A story of twists and turns will have players guessing the next step at every turn. Survival horror makes its way to Nintendo Switch with Resident Evil Revelations.